It's knitted on dpns. There are already some ends woven in. And the yarn. 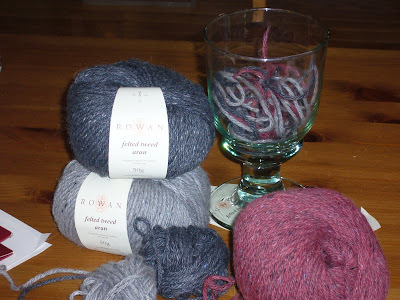 Now that I've knit a bit with the Rowan Felted Tweed Aran I can give you my impressions of it. The dark grey "Soot" is considerably softer than the light grey "Dusty" and the "Cassis". The yarn definately feels felted, but the plies still separate easily enough. It's easy to break my yarn without scissors when it's time to change colors. I like that! I have a serious problem finding scissors in my house. This yarn retails for about $12 in Canada, and that is probably the biggest deterent I would have in purchasing this yarn. I'm thrifty when it comes to my hobbies. But if anyone wanted to give me more of this again, I certainly would accept it gladly and enjoy knitting with it again.